My daughter is at uni. She had a job to supplement her loan for the past year, but has found it too much so she has given it up and is attempting to survive in London on her loan. I hope she can do this, and that she has learned enough from her frugal mummy to do it. But in case she needs some tips, this post is for her :-). She needs to learn to eat properly and try adapting recipes to suit what she has. 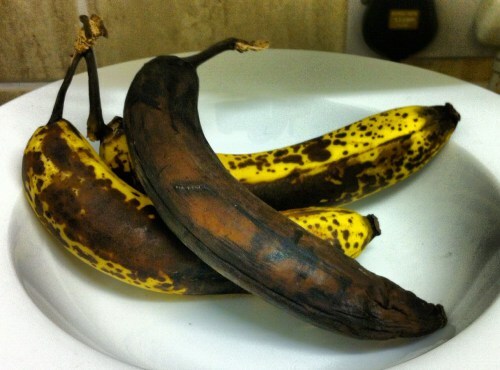 I made a banana loaf this morning with some very black bananas that no one was going to eat. I used the Delia recipe as my starting point, but as I didn’t have any walnuts or oranges I substituted brazil nuts and dried cranberries. It was really delicious! The frugal cook needs to be able to do this: either adapt recipes or make meals up to suit your ingredients. If you don’t have an expensive ingredient like sundried tomatoes try fresh or tinned with some tomato purée. If you don’t have shallots, use ordinary onions. If you don’t have dried porcini mushrooms, the usual fresh sort will work ok.
Make sure you have plenty of store cupboard staples. 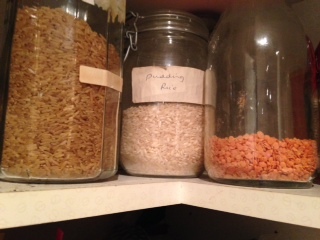 Flour and baking powder, tinned tomatoes, tomato purée, tinned or dried pulses, pasta, rice and noodles spring to mind. Casserole sauces bought cheaply from places like Approved Food and Home Bargains are good for days when you can’t be bothered or don’t have time to cook from scratch. 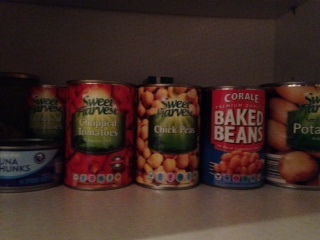 Tinned and frozen veg is handy to have. Canned tuna or sardines can make a good quick meal. Eggs and cheese are good to have in the fridge, and a pack of bacon can add flavour and interest to all manner of dinners. Is there really NO food in the house? What to do if you think there is no food in the house? Have a good look in the store cupboards ; I bet there is a ton of food in there. You may not be able to make a meat and two veg type of meal, but how about a lentil shepherds pie or veggie curry for a change? If you can make a tomato sauce from onions and tomatoes, you can build it into a veggie casserole with courgettes , carrots, lentils, etc and make some dumplings to go with it. Or use it to make a pasta sauce with garlic and peppers, or a bolognese with some mince meat. Add and taste as you go along. Mess about with curry powder, cumin and chilli to add a bit of spice to what you have. Eggs can make an omelette, a quiche, or you can crack them over your tomato and pepper sauce and bake them the oven. How about curried eggs? If you have flour you can make pastry. What do you have that will go in a pie? If you have cheese, onions and potatoes you have a veggie classic: cheese and potato pie with no pastry needed. Mash the spuds and mix in sautéed onions , plenty of cheese and some seasoning. Yummy with baked beans ! Use up all the bits of veg in a stir fry with noodles or rice. Make all kinds of fillings for a jacket potato with whatever you can find. Use recipes as inspiration and as a guide for quantities rather than feeling you need to slavishly follow them. And if you really can’t be bothered to cook, there is nothing wrong with the odd ‘something on toast’. Just try not to give in to too many wild nights at the uni bar with the Chinese takeaway or kebab on the way home :). Get into adapting recipes or even inventing them to use what you have. « Tower of London: A River of Red in an Ocean of People! Myra, from Winnipeg, Canada, where we are losing our lovely temps in the teens C and heading down to the normal of 5 or 6C in the daytime. Brrr! Yes I don’t think I have ever followed a recipe completely, always make adjustments to what I have on hand or what markdown specials I have picked up that week. You have given me some more ideas though. Also leftover salad leaves I use up in stews or casseroles.